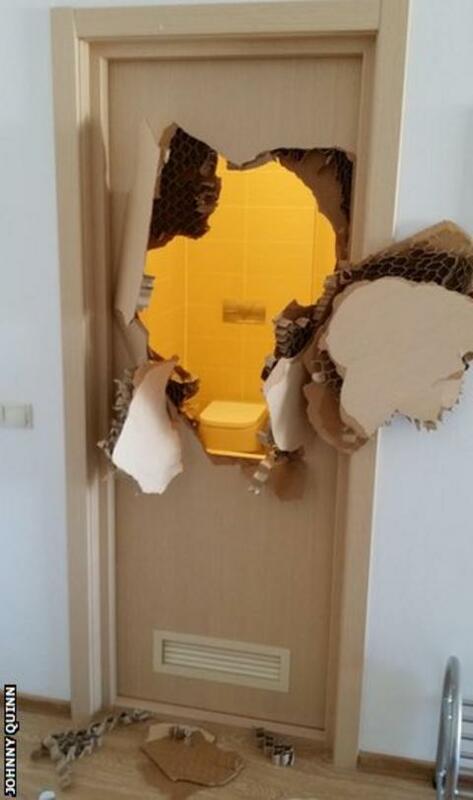 An American bobsleigher had to smash through a jammed bathroom door inside the Sochi 2014 athletes' village on the opening day of the Winter Games. Johnny Quinn became trapped in his room after a shower and, unable to raise help, simply burst through the door. "With no phone to call for help, I used my bobsled push training to break out," tweeted Quinn, 30. Separately, GB bobsleigher Bex Wilson emerged from her athletes' village room to find an open lift shaft. "Paula Walker nearly didn't have her brakewoman after walking out into this," wrote Wilson, captioning a photo of the open shaft. Walker and Wilson form the British two-woman bobsleigh team in Sochi. Quinn's US team-mate, Justin Olsen, wrote on Facebook: "My team-mate and room-mate had an issue with our door. I knew something would happen. "I wasn't there to help him out, at the gym. Trust me, he tried everything." The Sochi Games have had various problems with the provision and build quality of accommodation for athletes and journalists attending the Olympics. Reporters arriving in Sochi over recent weeks have documented unusual 'twin' toilet installations, unfinished hotels and problems with water and electricity supply.